I made 225 biscotti yesterday for Christmas. Yes, it took a long time, but it was so very worth it. 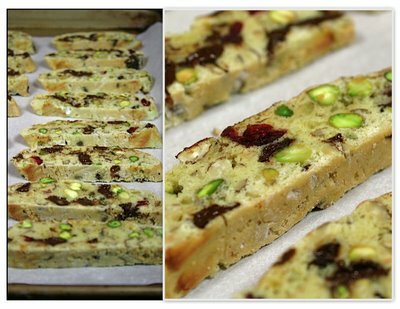 These Mosaic Biscotti are so beautiful and just look like Christmas to me. They contain hazelnuts, chocolate, pistachios and cranberries (my addition). These come from the Queen of Desserts, Gina DePalma, the pastry chef at Babbo. There is a reason Mario Batali hired Gina. She's brilliant but sensible. 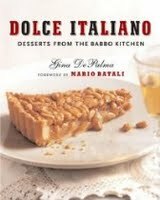 And if you aren't familiar with her, check out her book on desserts, Dolce Italiano. This book is such a must have if you like baking. If you aren't familiar with making biscotti, they really are very easy, they just take time. The dough is shaped into a wide log, baked and then sliced into the individual biscotti and then baked again until they are dry and crisp. These biscotti contain no butter, which allows them to last for several days, wrapped. You can make these ahead of time and freeze them for a couple of weeks. I have printed the recipe the way Gina makes them, without the cranberries. When I made them, I cut back on the chocolate a little bit and added about a cup of cranberries. You can certainly adjust any of the nuts or chocolate any way you like. Beat together the eggs, egg yolks and 2 cups of the sugar on medium speed until pale and thick, about 2 minutes. Beat in the vanilla extract, followed by the dry ingredients and then the chocolate and nuts, until the dough is thoroughly mixed. Using floured hands, divide the dough into 5 equal portions*. On a lightly floured surface, shape each portion of the dough into a log about 1.5 inches in diameter and 10 inches long. Place 2 of the logs on one of the baking sheets, 3 inches apart, and 3 of the logs on the second baking sheet, also 3 inches apart. In a small bowl, beat the egg with a fork until frothy. With a pastry brush, glaze each log with the beaten egg white and sprinkle with the remaining sugar. Bake the logs until they are lightly golden brown, firm to the touch, and just beginning to crack slightly, 20 to 25 minutes. Rotate the sheets 180 degrees halfway through the baking time to ensure even browning. Allow the logs to cool on the baking sheets on a wire rack until they are cool to the touch, about 40 minutes. Reduce the oven temperature to 200 degrees. With a sharp, serrated knife**, slice the biscotti slightly on the bias into 1/4 inch wide slices. Lay the slices on the baking sheets in a single layer. Return them to the oven and cook for 20 minutes more, or until they are toasted, dry and crisp. Cool the biscotti completely on the sheets and then store them in an airtight container kept in a cool, dry place for up to 2 weeks. When I baked these, I tripled the recipe and had about 225 biscotti. *You may make the biscotti any size you like. For larger biscotti, divide the dough into only 4 pieces. Make the logs a little wider and you will have longer biscotti. I cut the biscotti into 1/2 inch slices. **This is the knife Gina DePalma talks about in her video which she believes is the best for slicing biscotti. And it's great - I have one and love it. This looks so absolutely wonderful and delicious. I will make them--probably not this week, but very, very soon. Thank you for sharing your expertise. Wow, that's a lot of biscotti, but you should be proud... they're incredibly impressive and very holiday-ish! December 20, 2008 | Louisa N.
i've made 4 batches of her recipe, mine is slightly different but essentially it's really the identical gina depalma version. I loved them too! I tasted Elaine's and they were so yummy that I made them for my family today. They loved them. I may make more for my friends. December 21, 2008 | Debbie M.
I forgot to mention that I was unable to get hazelnuts so I substituted macadamia nuts. The biscotti was still delicious. Your biscotti look beautiful! I saw Gina Depalma promoting her book on the Martha Stewart show a while back, her recipes looked really interesting. I usually make a pistachio/ginger version, but I like the cranberry addition! 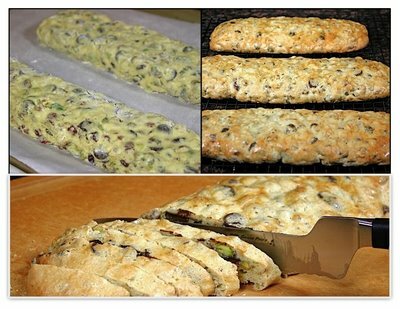 these look absolutely delicious (do i hear the pistachios speak to me "come to me").I have never treid biscotti- but my husband absolutely loves them. I will definitely try them. Thanks for posting. I will definitely try this recipe, they look absolutely delicious. Thank you for sharing the recipe on your blog. I could have sworn I commented on your gorgeous biscotti! I'm losing it! Probably all that sugar I've been eating!! I love this recipe of Gina's, so many goodies inside.Elaine, looking forward to what's in store for The Italian Dish in 2009! where did you find cranberries in Italy? I'd love to make this recipe - but have yet to find cranberries.... Thanks! Ashley: It's easy to find cranberries here - I don't live in Italy! I live in the United States, in MIchigan! Want to trade places? I would in a minute! They look so good. I was wondering if they had cranberries in them , it looks like something else is in the cookie can it be cranberries? I can’t wait to make them. Victoria: You need to read the post. Yes, there are cranberries in them. Gracias Eliane for sharing all the beautiful things. Last year I made your orangettes and gave to my German friends and they were in love with it. Today I gave some to my co-workers, and one of the managers said the orangettes are addictive. This makes me very happy, and it is all because of you. I am going to make the biscottis as well, they do look beautiful, and I like beautiful things. Wishing you and family a very happy, healthy christmas and prosperous new year. Elaine, I want to thank you for sharing Gina's mosaic biscotti recipe, I have tried for years to make biscotti and have failed miserably, but not this time. I have made 2 batches for the holidays already and they are absolutely delicious! I also love your choices for knitting, am going to try a new pair of mittens in January. These came out beautiful. Thank you for sharing. Found this recipe on Pinterest. I had never made biscotti before and loved the ability to watch the recipe creator make them on the video. They turned out perfectly. The twice baking process is a bit time consuming but the ease of the recipe makes up for that. Can't wait to make them again. Marsha: So glad you found Gina's video helpful! She passed away just a couple of weeks ago . . . very sad. These biscotti are delicious and great for gift giving! I made these for Christmas this last year with some modifications of my own. Was a HUGE success. My father even asked me to make him more for his birthday (this month). Thank you for sharing!